By The Carter Family. Instructional/Guitar/DVD. Country, Instruction. DVD. Homespun #DVDSEGCF21. Published by Homespun (HL.641792). ISBN 1932964797. 5.25x7.5 inches. 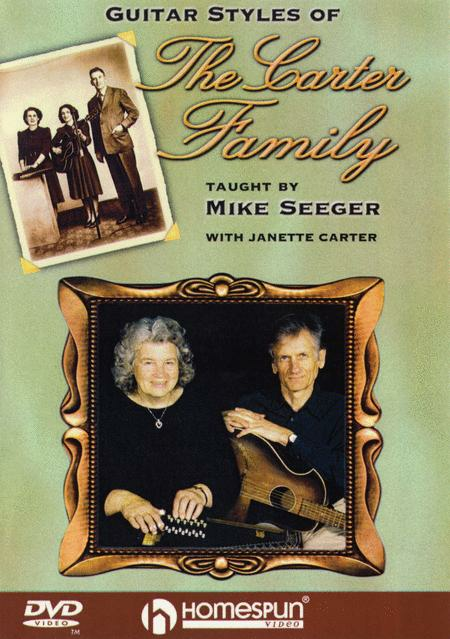 Taught by Mike Seeger with Janette Carter, vocals, autoharp and guitar. The Carter Family has been a seminal force in the history of recorded country music. Maybelle Carter's dynamic “thumb lead” style in particular is essential knowledge for anyone interested in playing traditional American folk or country guitar. In this lesson, Mike Seeger teaches how to get the famous Carter Family guitar sound and incorporate it into some of their most significant songs. Even near-beginners will be able to learn these pieces, while more experienced guitarists will enjoy the nuances and subtleties of Maybelle's influential style. Mike is joined by Janette Carter, who offers reminiscences of the family, demonstrates her aunt's guitar playing, and sings on most of the songs. Songs include: Wildwood Flower • Jimmie Brown the Newsboy • The Cannonball • Little Darling Pal of Mine • You Are My Flower • Pretty Polly • and I Never Will Marry. 85-MIN. • INCLUDES MUSIC + TAB • BEGINNER LEVEL.